Husband of Jennifer Wiggs Manning. Dad of Jena, Jake, and Joanna. Pastor of Unity Free Will Baptist Church in Greenville, NC. Sports fan. Drinker of fresh, strong coffee. My wife is five months pregnant. Last month we went for an ultrasound to see the baby and have the doctors check to make sure everything was progressing nicely. We had done this three times before and were excited. As we met with the doctor and ultrasound technician they referred to what they saw as “your child.” They must have said it 50x during the ultrasound as they referred to “your child’s hand,” “your child’s heart,” etc. Another doctor was brought into the room and for 5 minutes he stared at the baby’s heart. The room was completely silent. He then began to tell us that there was a tumor on our child’s heart and started to run down all the scenarios we were now faced with. Then the doctor said to us: “If the fetus is abnormal and that is management problem for you, you have the option to terminate your fetus.” The slight change in wording tells the story. I was in too much shock to respond. But later it dawned on me what he had done. The child my wife was carrying was only a child if we wanted to keep it, as if it was our choice! However, if we did not want the baby, it was only a fetus. Three weeks later we came back for another ultrasound. The growth on the heart was not a tumor, but a normal variant. In the doctor’s eyes, our child was a baby again. In our eyes, nothing had changed. I’ve always had an aversion for the word “fetus.” It may be a medical term. It may be the term of preference in a secular society. But I don’t like it! Never have. Never will. In “my book” and, more importantly, in God’s Book (Jer. 1.5; Ps. 139.13-14; compare Luke 1:41, 44 with Acts 7:19 where all three references use the same Greek word for “baby/infant”), the person who is brought into existence by Almighty God becomes a person at conception and remains a person throughout eternity! Are you growing in your walk with Christ? If you were the topic of a poll question and 100 people who know you well were asked, “Is he/she a mature believer?”, what percentage would answer “Yes”? What does a mature believer look like? Is spiritual maturity measurable? It’s good to enjoy the milk of the gospel with every meal. But some Christians pride themselves on focusing only on the gospel, snubbing the offer of deeper doctrines. The love of doctrine may need to be acquired over time, but it will always be there in a mature believer. Read and meditate on Hebrew 5.11-14. An infant’s meal needs to go through a blender for the first few months of his or her life. When a normal 21 year old still asks mommy to spoon feed him mashed potatoes, it’s creepy and dysfunctional. It is seldom that a mature believer feels offended. Offence is appropriate at any attack on God’s glory, as when the zeal of God’s house consumed Jesus and he aimed an Indiana Jones whip at the overpriced animals in the Temple’s corrupt commercial zone. But a mature believer doesn’t take personal offense easily. They understand that when someone sins against them, there are bigger issues at stake than their personal rights; e.g. God’s glory, the attacker’s relationship with God, etc. Take Paul. When he could no longer draw a crowd (being in jail for the gospel and all) rival preachers were pouring salt on his shackle-blisters by preaching the gospel in competition with him. He didn’t get uppity. Instead he seemed buoyed by the news that the gospel was still getting airtime (Philippians 1.15-18). That’s maturity! When you are first saved, it is natural to have a pendulum swing aversion to anything associated with your former way of life. That can be healthy. But as you mature, you will settle into a more balanced view of liberty. If Jesus says something is okay, then you won’t get upset when some Christians take him up on enjoying that freedom (Romans 14.1-3). The more you grow in your understanding of grace, the less it grates you that people ignore man-made religious norms. You may still choose to abstain, but your conscience is not plagued by the knowledge that others partake in what you avoid. God uses sinners to do his work for a good reason: there is no one else from which to choose. Some sinners are used mightily. A mature believer will always feel humbled by his effectiveness in God’s ministry. Often, though, the same privilege will inflate an immature believer’s ego (cf. 1 Timothy 3.6). Paul’s assumption is that a new convert—who is more likely to be immature—when used by God in ministry, will not possess the sense of surprise and humility that is a sign of maturity. Compare this to Paul’s own attitude that he is the chief of sinners, used only as means to show the extent of God’s mercy (1 Tim. 1:15). He considered himself the unlikely, unsuitable privy pot that was blessed to temporarily house the priceless treasure of God’s gifts (2 Cor. 4:7). Our world is an arena for idolatry. American Idol is the most aptly named and unblushingly honest tribute to our celebrity culture. Our hearts are geared to adulate and adore. An immature believer struggles to break the habit of idolizing people. He merely transfers his adulation of worldly celebrities onto spiritual celebrities. Whether it’s a pedestal for his pastor, or an inordinate reverence for John Calvin, or whatever the symptom, immaturity fails to give adequate credence to God’s power at work (1 Corinthians 3.4-7). What are some other signs of spiritual maturity? Help me add to his list by posting your comments below! I’ve been a subscriber to Sound Mind Investing for several years. It’s a Christian-based financial newsletter that makes recommendations on investing in mutual funds. You can read all about their services here. After the first year, roughly half of those who were millionaires (reporting over a million dollars in adjusted gross income) at some point between 1999 and 2007 were still millionaires. 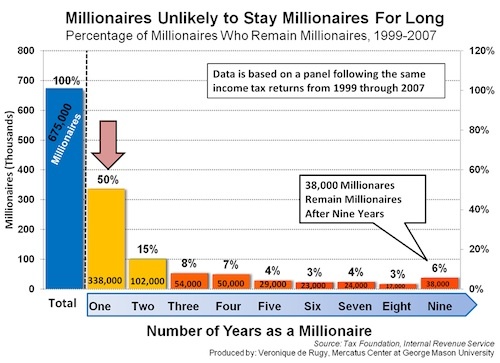 After two years, 15 percent — roughly 102,000 millionaires — retained that status. 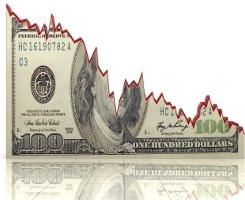 This decreasing rate of remaining millionaires persists, and only about 6 percent — roughly 38,000 millionaires — were millionaires for all nine years. Interestingly, things look rosier at the bottom of the income distribution. That same Tax Foundation study also shows that about 60 percent of households that were in the lowest income quintile in 1999 were in a higher quintile in 2007, and about a third of those in the lowest quintile moved to the middle quintile or higher. In other words, while it is difficult for one to rise from rags to riches, and while it may be harder now than it was in the past, there is still real upward economic mobility in the United States. Not Your Grandparents’ Department Store!